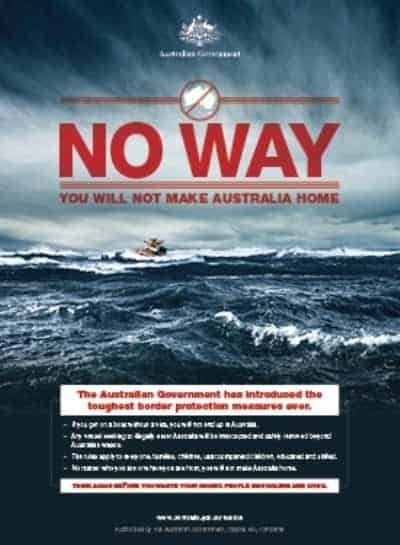 The poster depicting a seemingly doomed vessel on rough seas with the words ‘You will not make Australia home’ has attracted some very negative feedback for the Department of Immigration and Border Protection. The campaign which cost Australian taxpayers AUD$ 22.5 million in the last financial year aims to deter desperate asylum seekers from troubled regions such as Afghanistan, Pakistan, Iran and Sudan from seeking asylum in Australia. The poster displayed at Australian points of entry will be published in 17 different languages has started a social media firestorm. “I am absolutely disgusted in your ‘you will not make Australia home” video – you make me so ashamed to be Australian,” said Amy Clarke in a post to the Australian Customs Twitter account. According to the Monash University their Australian Border Deaths Database have recorded that almost 1,500 people have died while trying to seek asylum in Australia since the year 2000. Australia’s controversial asylum seeker policy includes sending those who arrive by boat to detention centres on Papua New Guinea and remote Pacific islands as well as paying neighbouring countries such as Cambodia to resettle the refugees.